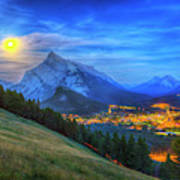 There are no comments for Super Moonrise Over Banff. Click here to post the first comment. 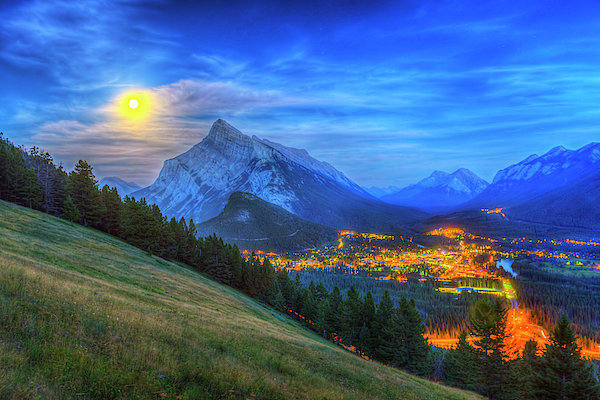 The supermoon of August 10, 2014 rising behind Mt. Rundle and Banff townsite, as shot from the Mt. 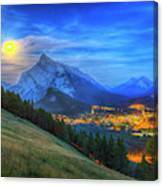 Norquay viewpoint looking south over the valley. This is an HDR high dynamic range stack of 8 exposures to capture the great range in brightness from the sky around the Moon (the Moon itself is inevitably overexposed) to the dark ground and trees. I�ve turned up the HDR intensity a bit more than natural to bring out cloud structure but that does give the image an HDR look. I shot this at the end of a 700-frame time-lapse, with the 16-35mm lens and Canon 6D. HDR processed with Photomatix Pro.